1″ (25mm), 1-1/4″ (32mm), 1-3/8″(35mm), 1-1/2″(37mm) bit sizes. Sure-Guide’s all-in-one drill system is a unique and innovative design that combines simplicity and the latest technology for the Stone and Tile Industry. 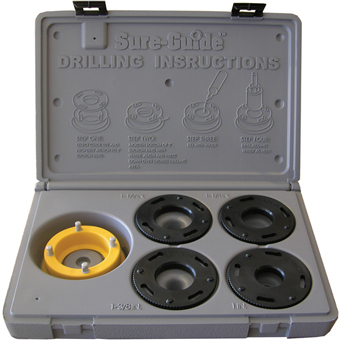 Sure-Guide is a self-lubricating drill guide system that produces clean and accurate holes with ease every time. Millions of dollars are spent every year correcting small preventable mistakes in the stone and tile industry. This cost effective drill guide system will prevent run-away etching, burning, and cracking upon break through, protecting your finished product. One of Sure-Guide’s greatest features is its ability to transform a multi-person project into a single-user task. Using Sure-Guide’s three inch suction ring, and one of four different sized guides, anyone can drill a clean and precise hole every time.